INTRODUCTION – Single port laparoscopy (SPL) remains an area of great controversy. Concerns over safety and true benefit remain. Laparoscopic fundoplication is still the gold standard for treatment of gastro-esophageal reflux disease (GERD). SPL fundoplication has been described previously. 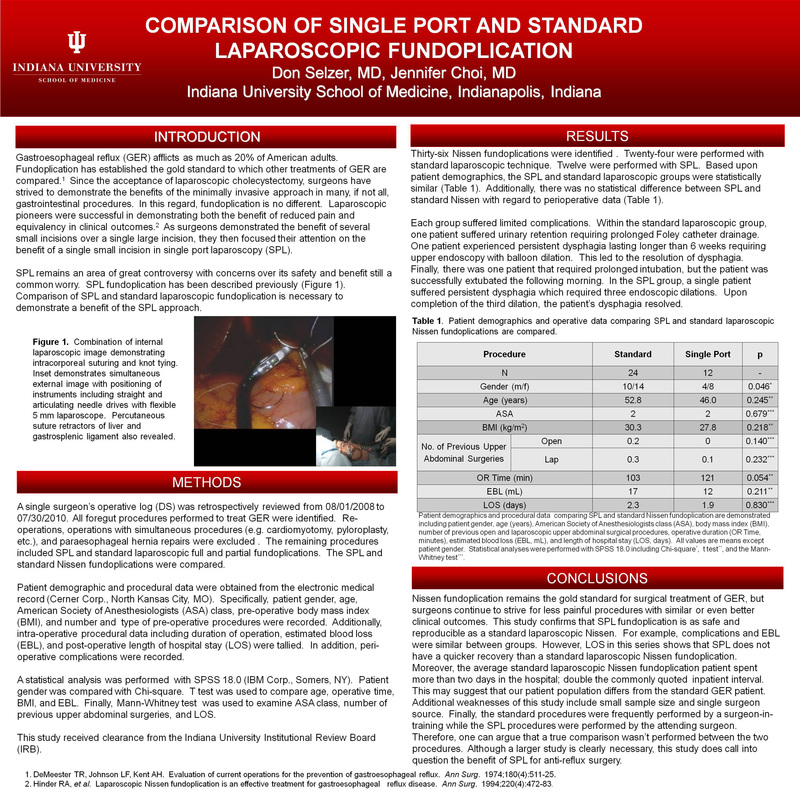 Although SPL fundoplication is feasible, comparison to standard laparoscopic fundoplication is necessary to demonstrate a benefit of the SPL approach. METHODS – Retrospective review of a single surgeon’s log was performed from 08/01/2008 to 07/30/2010. All foregut procedures were examined. Redo operations, operations with simultaneous procedures (e.g. cardiomyotomy, pyloroplasty, etc. ), and paraesophageal hernia repairs were excluded. Remaining procedures included isolated SPL and standard laparoscopic Nissen and Toupet fundoplications. Demographic and procedural data were evaluated. Statistical analysis was performed (SPSS 18.0). Chi-square examined patient gender. T test compared patient age, operative time, BMI, and estimated blood loss. Mann-Whitney test examined ASA grade, number of previous upper abdominal surgeries, and length of hospital stay (LOS). RESULTS – Thirty-six fundoplications were identified. Twenty-four were performed with standard laparoscopic technique. Twelve were performed with SPL. Based upon patient demographics, the SPL and standard laparoscopic groups are statistically similar (Table). Complications were limited and similar between groups. CONCLUSION – SPL fundoplication is safe and reproducible. However, LOS in this series shows that SPL does not have a quicker recovery than standard fundoplication. Weaknesses of this study include small sample size and single surgeon source. Additionally, the standard procedures were frequently performed by a surgeon-in-training while the SPL procedures were performed by the attending surgeon. Although a larger study is clearly necessary, this study calls the question of the benefit of SPL for anti-reflux surgery.